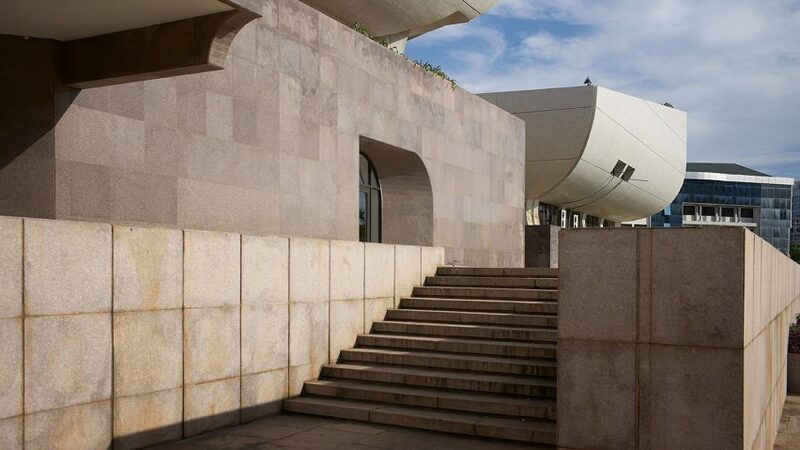 Belgian photographer Julien Lanoo took these images of the National Theatre of Ghana built in Accra in the early 90s, which features smooth, white volumes elevated above the surrounding streetscape. Lanoo has travelled to Ghana regularly in recent years to photograph or film architectural projects including an eco lodge in Cape Three Points and a children's hospital in Efutu, as well producing an abstract movie about Accra's Jamestown beach. 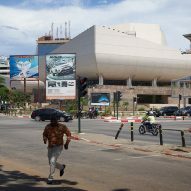 During one of his visits to the Ghanaian capital, he was attracted by the National Theatre of Ghana's scale and unusual architecture, which stands out amid the bustling urban realm of downtown Accra. The theatre was built in 1992 using funds provided by the Chinese government. "The theatre, like a UFO, stands within an amalgam of modern architecture that imitates occidental cosmopolitan metropolis," the photographer told Dezeen. "Its peculiar form, size and noble materials create a very strong social dynamic inside and out." "It somehow belongs there and it's a magnet for 'happening'," Lanoo added. "Market vendors of all kinds, social interactions and people resting in the shades of its trees, and rehearsals inside. This building made me think, and I had to photograph it one way or the other." 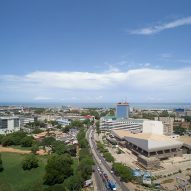 The 11,900-square-metre theatre complex is located on a prominent site in the Victoriaborg district, at the junction of Independence Avenue and Liberia Road. A group of bulging roofs covered in tiles lend the theatre a distinctive presence, and have led to it being compared to a huge ship or a bird spreading its wings. In 1989, the governments of the Republic of Ghana and the People's Republic of China signed an agreement that saw China provide funding for the construction of the National Theatre building as a gift to Ghana. Chinese architects Taining Cheng and Xianghan Ye were officially responsible for the building's design, although the involvement of experts from both countries in the development and construction process resulted in a hybrid aesthetic. The first performance was by the theatre's three resident groups; the National Dance Company of Ghana, the National Symphony Orchestra, and the National Drama Company, Abibigromma. This was followed by a performance by a Chinese cultural troupe. 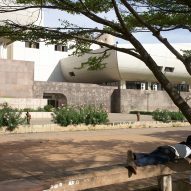 The building occupies the former site of the University of Ghana Drama Studio, which was moved to the university's campus and reconstructed simultaneously to the theatre. 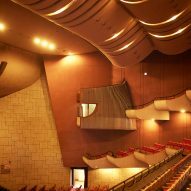 In addition to multi-functional venues for concerts, dance and drama, the National Theatre provides facilities for staging exhibitions and special events. Reinforced concrete was used for the building's main structure, with the lower parts of the facades clad in polished dark-grey granite. The curved surfaces of the roofs are covered with small, white mosaic tiles that give the upper half of the theatre a contrasting light and slightly reflective finish. Internally, the building is divided into four parts to ease navigation. 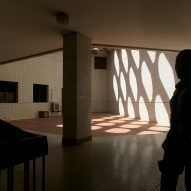 Circulation is arranged around a void topped with a perforated concrete roof that casts graphic patterns of light and shadow onto a tiled courtyard. The main auditorium is lined with scooped concrete balconies and features chairs covered in brightly coloured upholstery. According to Lanoo, the internal spaces are "designed incredibly intelligently", and appear to be naturally cooled by a system of patios and perforated brickwork surfaces that channel breezes through the corridors and office spaces. "The more private rehearsal spaces are ideal for their function, the seating areas are dynamic and designed within the space's atmosphere," he added. "At the same time as it is dark and intimate, it is luminous." During his visits to Africa, Lanoo has developed an affinity with the places and people he has visited, gaining an insight into the culture and architecture of Ghana and the Ivory Coast, in particular. "I fell in love with Africa – its colours, its sounds, its people and its down-to-earth problem solving," he explained. "The colour of the earth there is not only red, it's blue, it's green, it's grey. Life is everywhere, and can be both easy and harsh, but there is a certain positive state of mind; hence the architecture – it's diverse, dynamic, full of life and history." 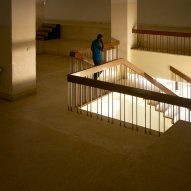 Two images taken by Lanoo during his time in Ghana were among three photographs for which he was nominated at the Arcaid Images Architectural Photography Awards 2016. He previously documented a "makerspace" implemented by a group of architects at the world's biggest dumping ground for electronic waste in Agbogbloshie, Ghana. Lanoo has also photographed many significant architectural projects around the world, including Zaha Hadid's Issam Fares Institute in Beirut, and South Korea's tallest skyscraper – the Lotte World Tower by Kohn Pedersen Fox.